So I tried this thing last year and (surprise) kind of failed at it, but I’m trying it again. 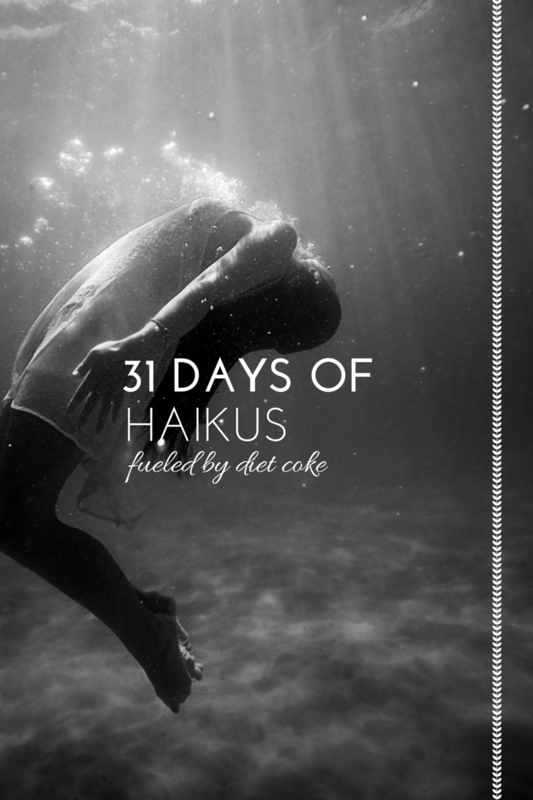 Only this time, I’m managing expectations and only committing to writing a haiku a day. Seems reasonable, right? I mean, even the most terrible bloggers can manage to churn out three lines of seventeen syllables. Want to follow along? Maybe give me some encouragement so I don’t quit? Glad to have you on my team. DAY THREE: nursing to sleep. DAY SEVEN: when my husband comes home. DAY FOURTEEN: car ride home. DAY FIFTEEN: to him i belong. DAY TWENTY: date night in. DAY TWENTY-ONE: things i’m interested in. DAY TWENTY-FOUR: a three-year-old’s halloween costume. DAY TWENTY-SIX: the emergency room. DAY TWENTY-SEVEN: house of illness. DAY TWENTY-EIGHT: toasted graham latte. I am also doing Write 31 Days, and hoping that I won’t be a failure as I have been the past 2 years! I love your idea of haikus-they say so much with so few words. 🙂 Good luck to you!